Cut tomatoes into thin round slices. 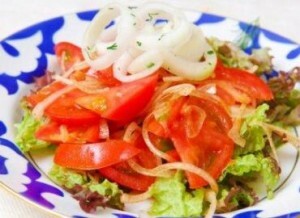 Cut onions and pepper into very thin semi-circular slices. Combine all ingredients in a bowl, add salt, mix lightly. Arrange a hillock in salad bowl and top each serving with sprig of greens.